I dare you to say THAT three times fast. Even better, do it in front of a mirror. I tried. I failed. I laughed. Yes, this is what I do in my spare time. …was too dark in my opinion and was falling apart. The bamboo pieces around the edges were falling off, and we’d lost the door handle. Normally, this wouldn’t bother me. I’d just fix it, replace the hardware, paint it and move on. What did bother me was that these pieces were basically stapled on. And when they come loose, there were sharp staples just waiting for Lucas to hurt himself on. And there was no telling which area would come loose. Lucas would just walk out of his room carrying yet another broken piece. So, it needed to go. The other day I attempted to sift through No Man’s Land (our spare room/resident dumping ground for those who don’t know) and I came across a hand-me-down Ikea Lack table that was given to us a while back. 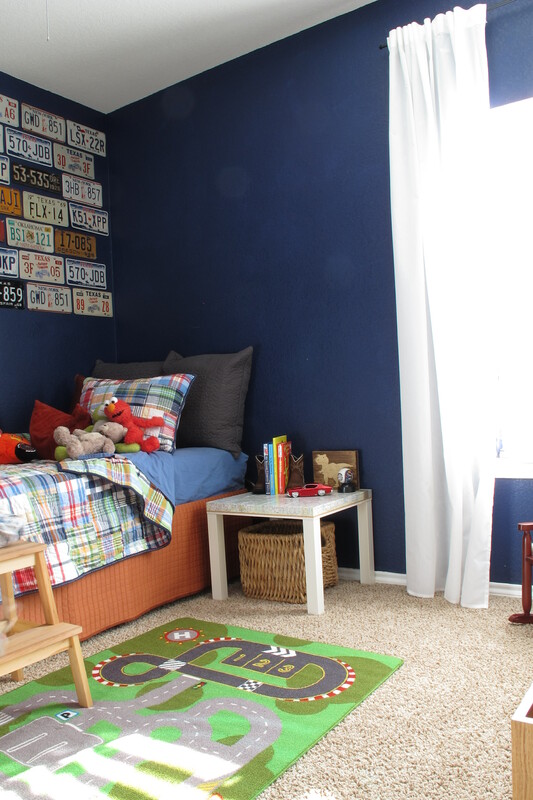 I’d kept him (and his twin brother) with the thought of turning them into a headboard for Lucas’s bed. This plan never came to fruition because I didn’t like the scale of the tables with the bed, so they’ve just been taking up space in decorating purgatory ever since. It’s funny how leaving an item alone for a while and then coming back to it later can give you a fresh, new perspective. 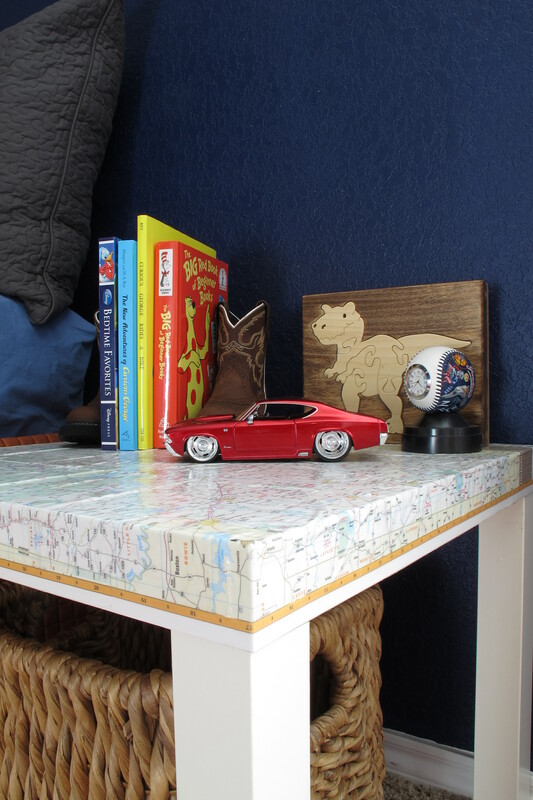 Upon rediscovering the table, I realized that at least a temporary solution to the nightstand dilemma was waiting for me for free in our spare room this whole time. 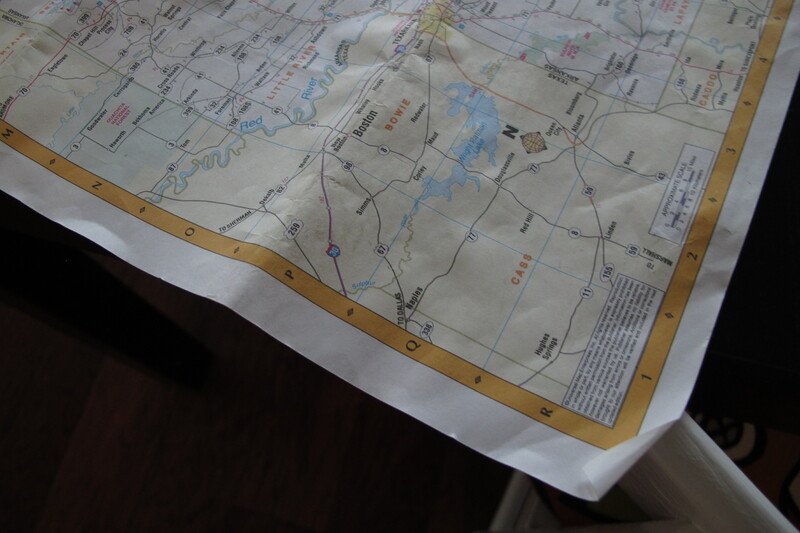 As I continued to organize our junk, I found a map that we’d used to find our way to Eureka Springs for our honeymoon years ago… And the thoughts connected. 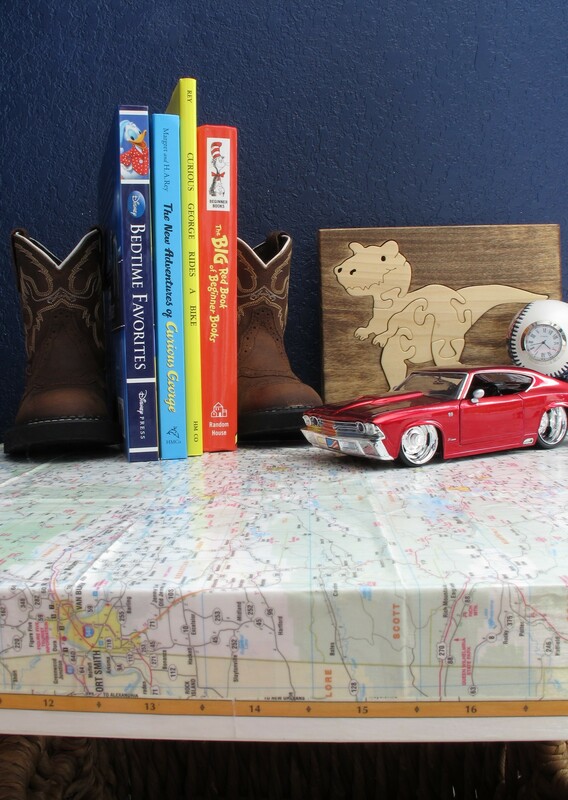 Lucas’s transportation themed room + Map = YESSSSS!!!!!!! 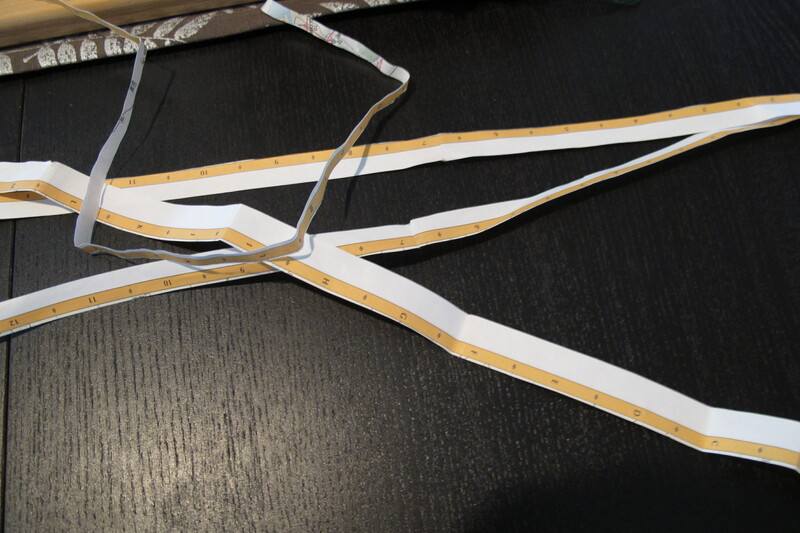 I started by cutting off the mustard trim on the edge of the map, as I wanted to finish off the table with it later. 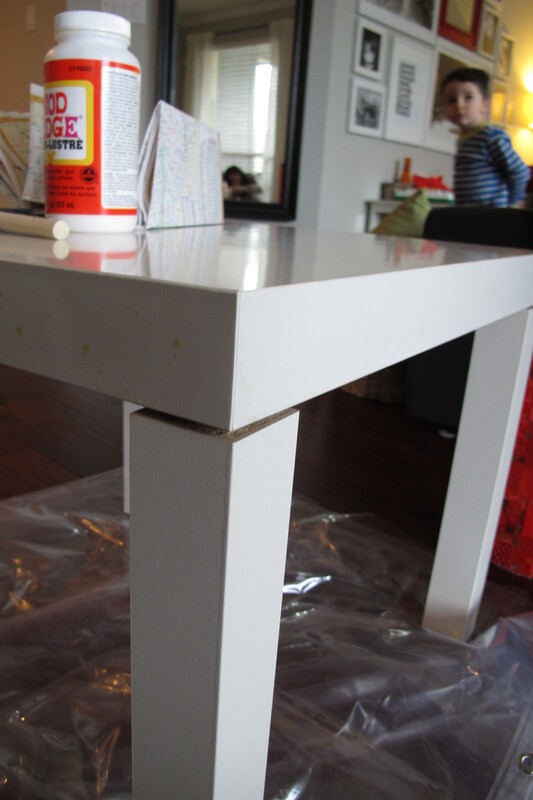 Then, I unscrewed the legs a smidge to make it easier to trim out the top…. I thoroughly cleaned the table and used a liquid deglosser to rough up the surface. 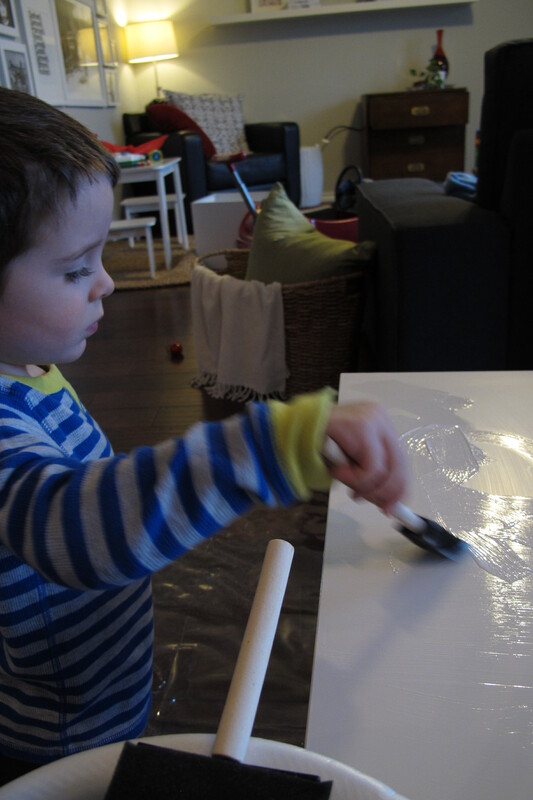 Then, I applied a coat of Mod Podge, which the little man helped with…. 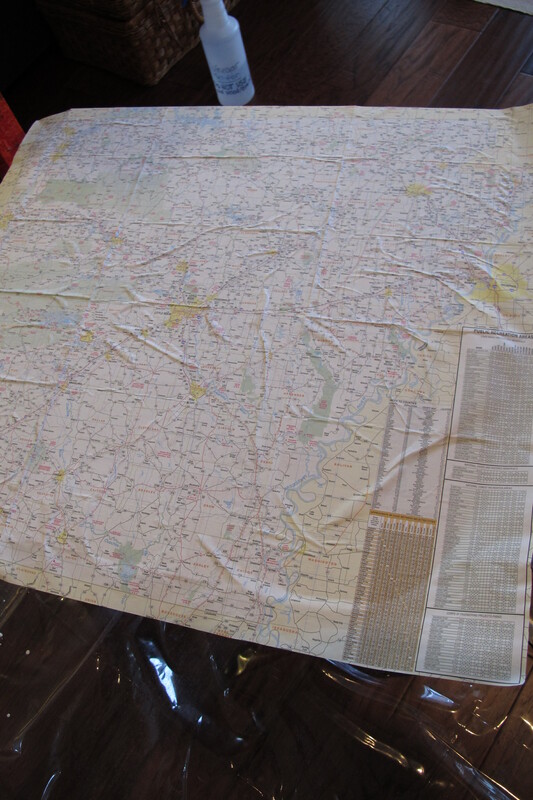 I applied the map over top and did my best to smooth it out…. 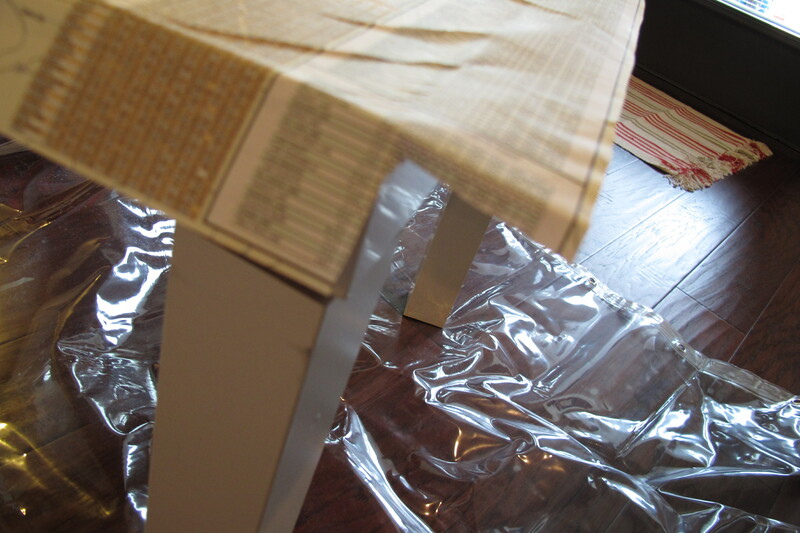 Applied Mod Podge to the sides and folded over the edges…. Once I was through with this, I carefully lined up my border and applied it all around the edge…. 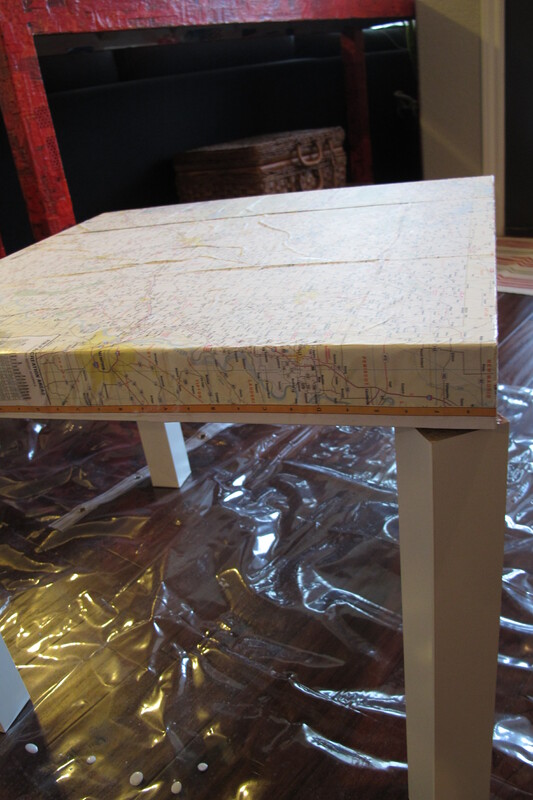 And followed it up with three coats of Mod Podge over top. I did have an issue with air bubbles. On the bad ones I simply sliced a small hole in the paper and filled it with Mod Podge to allow it to seep under the paper, then I smoothed it with my finger. 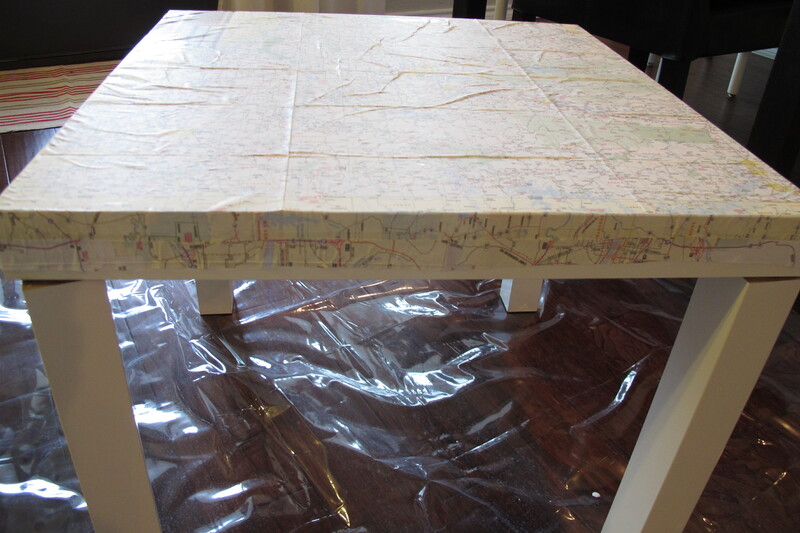 I probably should’ve applied a thicker coat of Mod Podge to the table before applying my map, but ya live, ya learn. It’s definitely not perfect. It has creases and air bubbles, but I actually like it that way. It looks leathery and weathered. 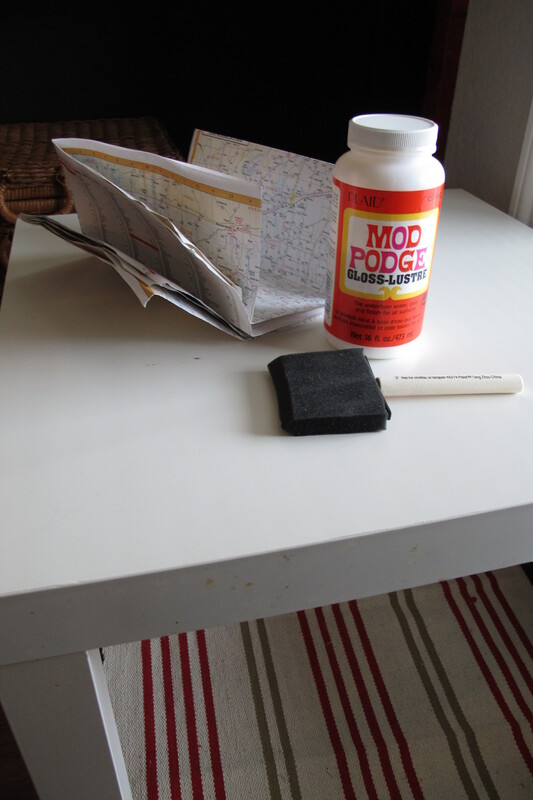 I was actually thinking of tinting some Mod Podge and going over it again to give it more of an aged look. For now though, I’m gonna leave it as is. I added a basket underneath that was also living an unfulfilled life in No Man’s Land to fill my storage requirement. It now holds the books that were in Lucas’s old night stand. 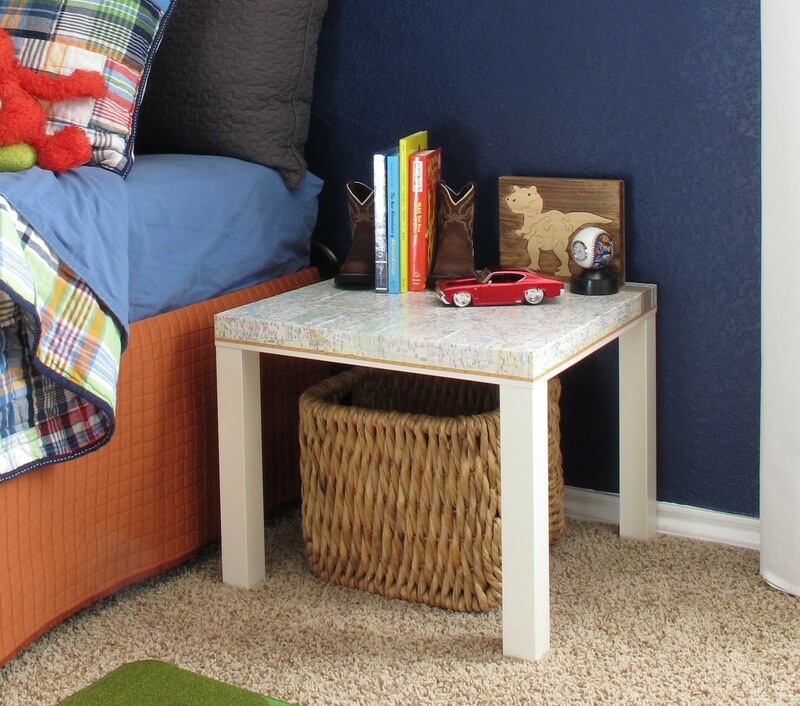 I like that Lucas can always pull over his rocking chair and use this table to read or color or whatever. It has enough table surface to serve more than one purpose for sure. How cute! I love how you used the border around the edge. It fits the room perfectly. Looks great! Another idea is to slightly burn the edges of the map and then lay it down. Love it. Nice work. 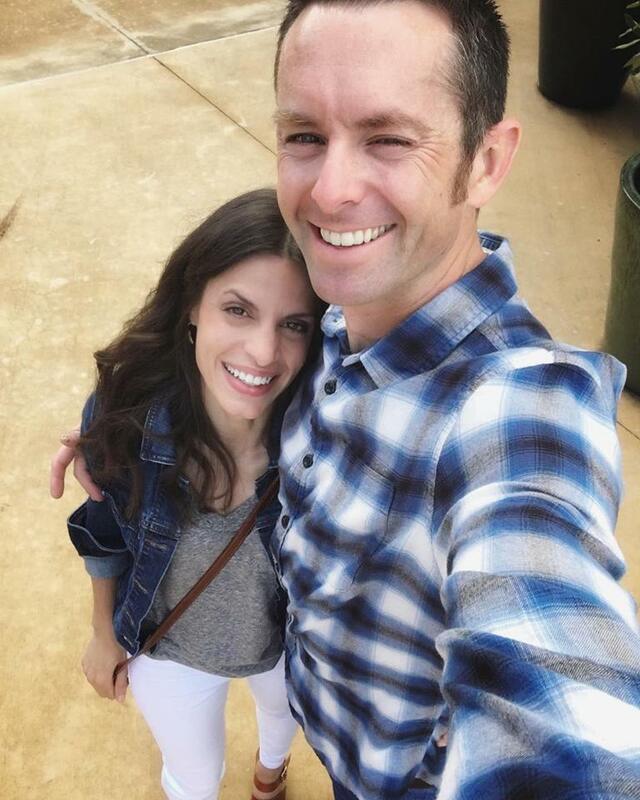 Christina…looks great! 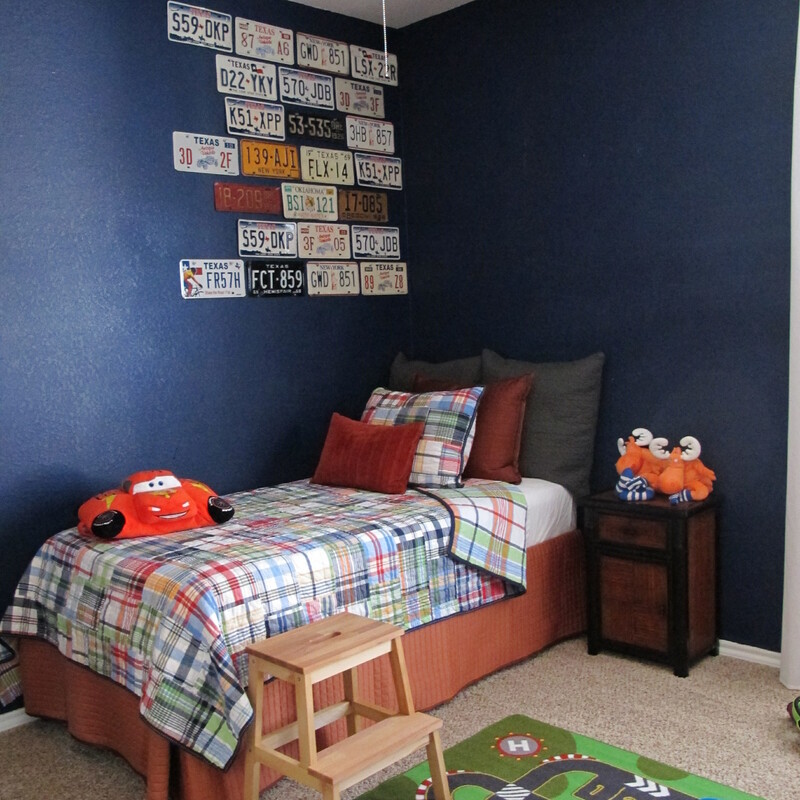 Do you mind me asking what brand/where you got the bed “skirt”? I struggle with my girls’ bed skirts every day…that one looks as if it stays in place 🙂 THANKS!